Bacon and cheese braaiwors is delectable, but by combining it with sesame pap and chakalaka, a star is born! The smoky and tangy sausage is perfectly complemented by the spicy sauce, with the pap finishing things off for a delicious balance. Start with the chakalaka, add the oil to a deep saucepan. Heat and add the onion and red peppers to sauce. Once they have softened slightly, add the spices and dry fry till fragrant. Add the whole tomatoes, baked beans and carrots continuing to stir to combine well. Lastly, add the tomato paste to thicken the chakalaka. Keep stirring the chakalaka until smooth and doesn’t stick to the bottom of the pan. This should take roughly 10 minutes. Set aside to cool slightly. When ready to serve, fry or braai the Woody’s Bacon and Cheese Braaiwors on a griddle until just cooked, roughly 10-15 minutes. While the Bacon and Cheese Braaiwors is cooking, make the pap according to the packet. Once the pap is ready, add the toasted sesame seeds and knob of butter to finish it off. 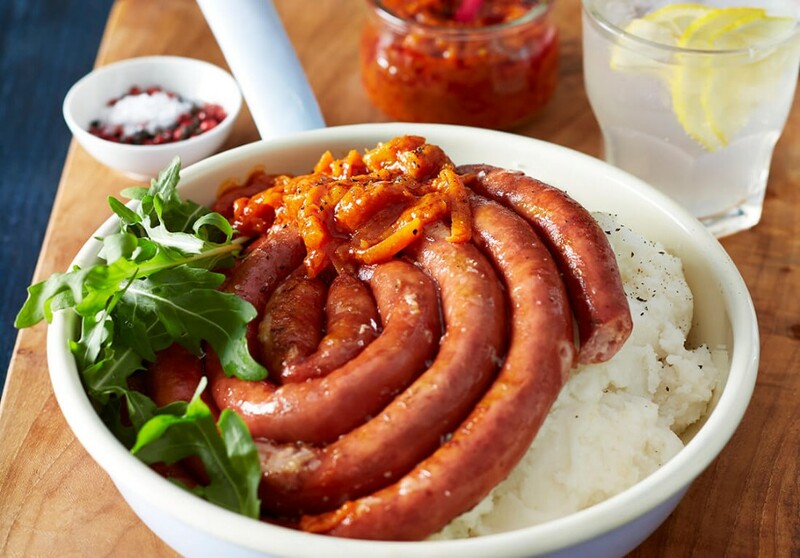 Serve the pap and wors topped with chakalaka and an optional Rocket salad.